SPECIAL - ALL FIVE JOHN SEXTON POSTERS - SIGNED!!! 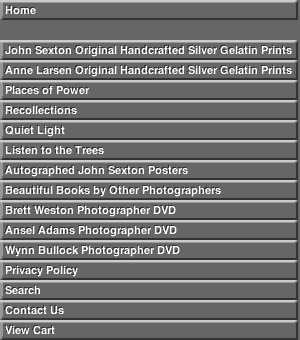 This is a special opportunity to save by purchasing all five of John Sexton's posters shown below. The suggested retail price on each poster is $35.00. Individual posters are available for purchase here for the special price of $25.00 each. NOW GET ALL FIVE POSTERS - SIGNED BY JOHN SEXTON - for just $100.00. That's a savings of $75.00 from the suggested retail prices, and $25.00 less than our individual discounted prices. Standard shipping is only $12.00 for your entire order (Continental US only). © Copyright 2000 - 2019 Ventana Editions. All rights reserved.